The advent and improvement of smartphone and tablet technology in the last decade means we can now play many of the most popular card games online through our mobile devices. This page lists our favourite card game apps for international players, as well as where to find them and the different options for iOS, Android, BlackBerry, Windows and all other advanced mobile operating systems. Each of the recommended mobile card game sites on this page are licensed and legal for international players, and offer both free play and real cash gaming. For Australians, this page is intended for informational purposes only due to the Interactive Gambling Amendment Bill 2016 rendering online gambling illegal after September 2017. 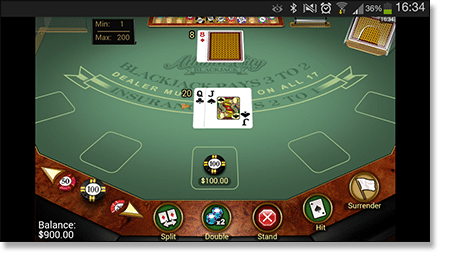 Atlantic City Blackjack Gold – This new addition to the mobile 21 world features classic American blackjack rules with a few little twists. We love the late surrender option and the fact we can double down on any initial hand, as these rules help bump the expected return rate up to a very tasty 99.68 per cent. Classic Blackjack Gold – This single-deck blackjack title is one of the best value casino games on the Net, with a bunch of player-friendly rules that leave the house edge as low as 0.13 per cent – which is worlds better than the pontoon and blackjack tables at land-based casinos these days. European Blackjack Gold – A mainstay of mobile casinos for so many years, and still one of the best BJ games going around. The killer feature here is the $1000 bet limit, which makes it a super option for hi-stakes blackjack players. The Royal Vegas blackjack app is available from the iOS App Store, Google Play for Android products, the Windows Phone Apps + Games Store and BlackBerry World. Alternatively, you can pull up the dedicated Royal Vegas Mobile Casino site and create your own Web app (no software installation required) – this has all the same games as the market app. Note: the RV market application will be labelled “Regal Vegas” in some application markets. This is purely for branding purposes. Once you load the app and log in, you can select either practice mode (Regal Vegas) or real money play (Royal Vegas). This app is 100 per cent legal for players over 18 years of age (in some countries it is 21 years old – check in the terms and conditions before downloading). If it’s good old Texas Hold’em you are after, you can’t go past www.888Poker.com – our number one recommended mobile poker site. Android users can download the official non-market application direct from the 888 website via their device, while folks with iPhones and iPads play directly through Safari on the browser-based Web app. Other smartphones and tablet users can access the 888 mobile platform, too. 888 Poker supports both free play and real money poker, with a super spread of gameplay and betting options – including fixed limit and no limit games – that cater for all tastes and bankroll limitations. Cash Games – Buy in and cash out whenever you like, with up to nine players per table and stakes ranging from just $0.01/$0.02 up to $10/$20 blinds. Sit & Go Tournaments – Choose from Normal, Turbo and Super Turbo tables in this fast-paced competitive setup, with buy-in levels between $0.11 and $400. Scheduled Tournaments – Play for pride, cash, or a seat at the big boys’ table with 888 Poker’s super selection of multi-table tournaments and mobile satellite events, running seven days a week. If you want even more real money mobile poker action, you might want to have a look at PokerStars and Full Tilt – two highly trusted sites which offer secure mobile hold’em games for Android devices. The Jackpot City mobile casino is one of the best portable gaming hubs for avid card players, especially if you like real cash video poker. There’s several electronic draw games on offer here, including Aces and Eights, Aces and Faces, Deuces Wild, and Double Double Bonus. Our favourite is Microgaming’s classic Jacks or Better poker game, which comes with a 4000-coin bonus on the royal flush and a theoretical return of 99.54 per cent – one of the lowest house edges you will find on any Web-based casino game. Click/tap here to bring up Jackpot City in your browser and create the convenient Web app for all smartphone and tablet devices. For more mobile video poker, also check out any of the top-rated card game sites listed in our table at the top of this page. Native apps & Web apps: What’s the difference? There are two kinds of apps we can use to access online card games via our mobile devices: native applications and Web applications. While both effectively offer the same function, they do so in different ways. A native app is a compact executable file which resides on the hard disk of a smartphone and tablet. These are the programs we download from markets such as the App Store or Google Play, or sometimes directly from an online casino or poker site. The Royal/Regal Vegas Casino app for iOS, Android and other devices is an example of this kind of product. A Web app, on the other hand, is more like an Internet bookmark. It looks just like a market app on your home screen, and it basically does the same thing – but instead of opening a casino suite or poker lobby which is installed on your phone or tab, it links directly to a Web page. This means it takes up very little space on your mobile hard drive, and that there are no availability or licensing issues for different markets. Both native apps and Web apps allow us to access casino card games and online poker rooms with ease. A native app comes with the bonus of being all laid out and ready to go as soon you install it, although it takes up more disk space; while Web applications make no discernible dint in your data, although they use more data the native applications. We at ACG love Web apps because they are easy to make, they don’t take up precious room on your smartphone’s hard drive, and we don’t have to install anything. While the process differs slightly from device to device and system to system, in all cases it should only take a matter of seconds to get instant access to your favourite mobile card games from your phone or tablet’s home screen. 1. Pull up your favourite real money casino or poker website on your mobile browser. 2. In the bar at the bottom of the screen there are five icons. Tap the ‘Action’ button in the centre, and then select ‘Add to Home Screen’. 3. Name the app whatever you want, then hit ‘Add’. A thumbnail icon should now appear on your home display among the rest of your applications. Alternatively, enter into the game of your choice, and then hit the ‘Action’ button once you’ve opened the game – instead of the entire casino being created as a Web app, only your specific game of choice will be made in to a browser-based application. Three taps, and your done. Now you can simply tap the app on yout home screen for easy access to your favourite instant play mobile sites and card game apps, with no lengthy URLs or pesky auto-correcting browser bars required. This process is just as quick and easy on Android phones and tabs (HTC One, Sony Xperia, Samsung Galaxy, etc. ), as well as BlackBerry and Windows mobile products.